Carlos Jacquez smiles after winning his semifinal match against an opponent from the University of Central Oklahoma at the NCAA DII Super Regionals in Hyland Arena in February. When Carlos “Chachi” Jacquez steps onto the mat, “ready to go” are the perfect words to describe him. Jacquez started wrestling at the age of 4, and he said his passion for the sport has never stopped growing. Last month, he faced his biggest test in Cleveland, Ohio, when he competed for a national championship. Coming into the tournament, Jacquez defeated two opponents to become a two-time All-American and advance to the finals. 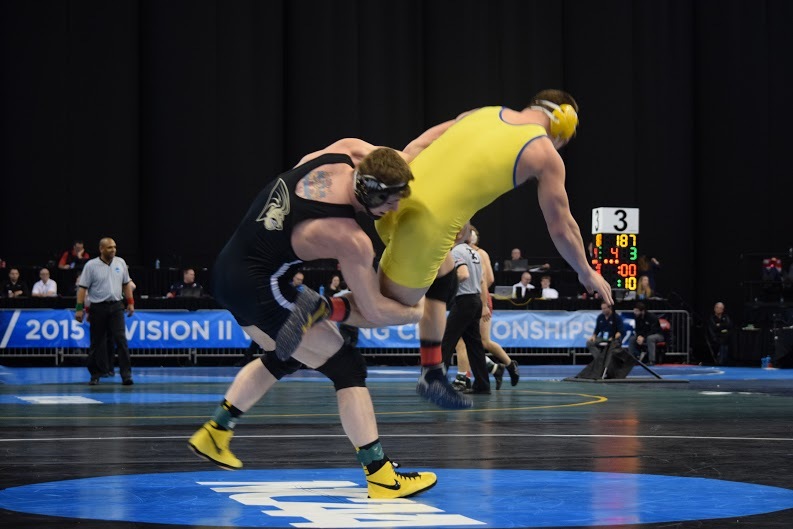 Jacquez secured the victory after two takedowns in the third period to become the 2019 NCAA DII national champion. Jacquez’s mom, Jennifer Urrutia, got him and his oldest brother Greg into wrestling. “He and his brothers were always fighting; I said go out and play on the mat,” Urrutia said. 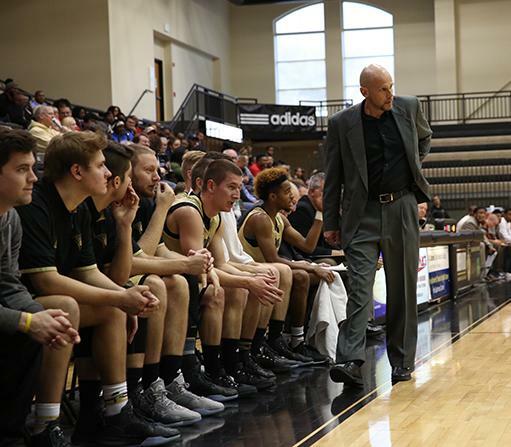 Jacquez’s oldest brother Greg, who was a junior college All-American, competed and practiced at Lindenwood under current program coach Jimmy Rollins’ direction. That’s how Chachi Jacquez got on Rollins’ radar. Jacquez, a 21-year-old from Illinois, attended West Aurora High School and became a three-time conference champion and a two-time state qualifier. 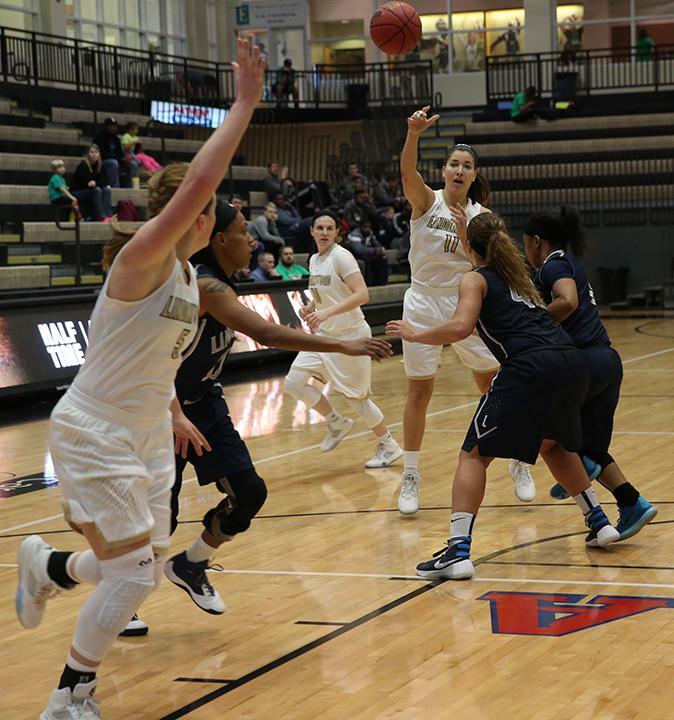 Once Jacquez arrived at Lindenwood, he said his fierceness and desire to win and get better only intensified. After redshirting his freshman year, he came back to record a 22-7 season and finished sixth in the NCAA DII Super Regional and second at the MIAA Championships. In the 2017-2018 season, Jacquez earned All-American status after placing sixth in the NCAA national championships and won a team high of 29 matches in the 125-pound weight class. But it was still not enough. After forfeiting in two tournaments due to a knee injury in the same season, Jacquez wanted to come back stronger than ever. With the help of his coach and athletic trainers, Jacquez entered the 2018-2019 season as the wrestler to defeat. According to the Lindenwood Lions website, Jacquez is the third most dominant wrestler in all NCAA Division II. Going into the NCAA Super Regional that took place at Hyland Arena on Feb. 23, Jacquez swept all of his opponents to come out as the reigning champion. “One big thing that I’ve been focusing on when matches aren’t going my way is keeping my composure, keeping calm, not getting too worked up about it, just wrestling,” Jacquez said. During the NCAA Super Regionals, Jacquez got inspiration from his family, who came to watch him compete. His family made t-shirts with “Team Jacquez” on the back and the Lindenwood logo on the front. Jacquez said going into the first match, he felt a little more pressure having his entire family present, but when the cheering started, his confidence outweighed the nervousness. During one match, Jacquez swiftly moved his feet around the mat while his eyes looked fiercely at his opponent. He was focused and determined to take him down, and when he did, he controlled him until he won the point. Once Jacquez knew he had won, he raised his arms, flexed and pointed at his family, and his intensity never went down. Outside of wrestling, Jacquez is an anime lover and Pókemon Goer. He is majoring in math with an emphasis in education. Combining wrestling and school can sometimes be difficult, but Jacquez said he is determined to help make a difference in the world. After he graduates, Jacquez plans to coach and teach either back in his hometown Aurora or somewhere in the St. Louis area. Published March 14, 2015; 10:15 p.m.
Dec. 5, 2015; 7:03 p.m.